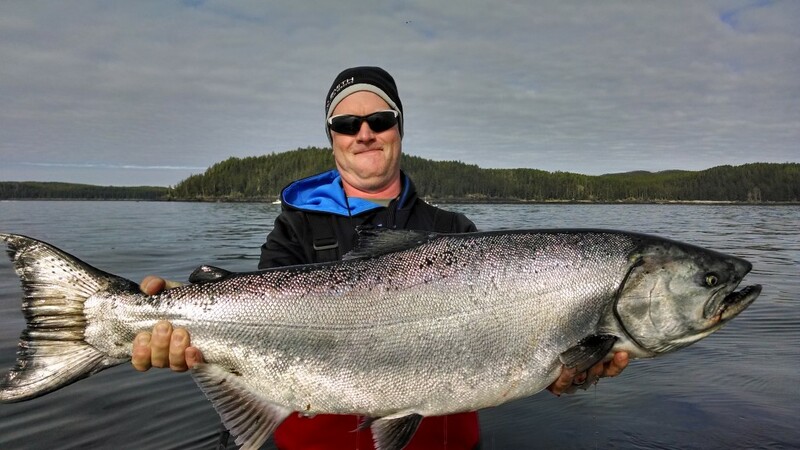 Like The Outpost and The Clubhouse, opening week at North Island Lodge kept everyone busy with great numbers of spring Salmon in the mid to high teens, lots of double-headers and the early arrival of Cohos. It didn’t take long for our guides to put the guests on the tyees as we caught our first of the season the opening morning, a 31-pound spring for Chris Mackay. After opening day, the word in the dining room and around the lounges was that everyone was very impressed with the volume of Salmon around and especially the early arrival of Coho in the 5 to 6 pound range. As the month progressed, the average size and volume of the Chinooks continued to increase and both sides of the Island were producing fish. As the second week of June rolled around so did the the first batch of larger Chinooks and over the next two weeks our guests caught over 10 tyees. 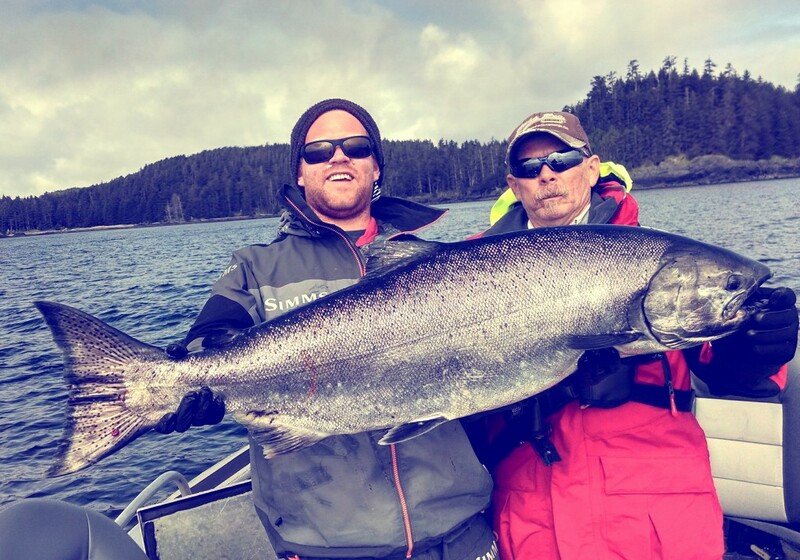 The bar for biggest Chinook was set early and high in the second week as Peter Degroot and guide Jacob Brunelle released a beautiful 40 pounder. 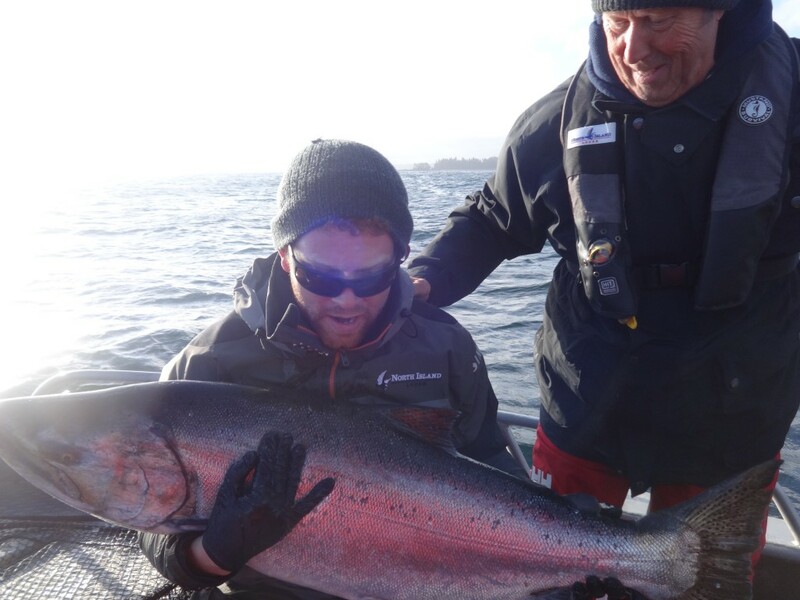 Later that week Richard Butland and guide Tanner set the bar a little bit higher as they released a 41lb tyee they caught off the horn at Andrews Point. However, it was later on in the third week that the first 50 was caught as Dennis Dieni took over top rod with his 55 pound release with guide Drew Manson on a sunny June afternoon. 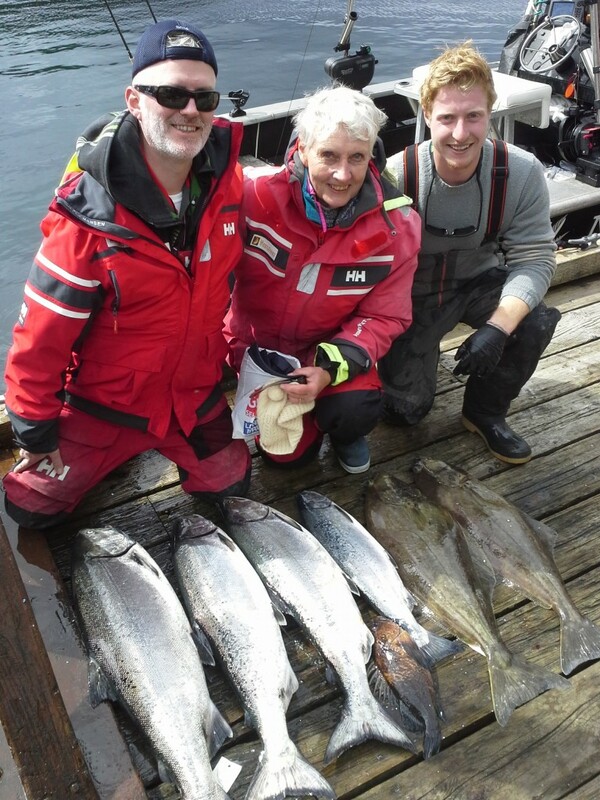 The spectacular fishing that we are now used to in June on Langara Island spoiled our guests right up until the end of the month with very busy and exciting days on the water. 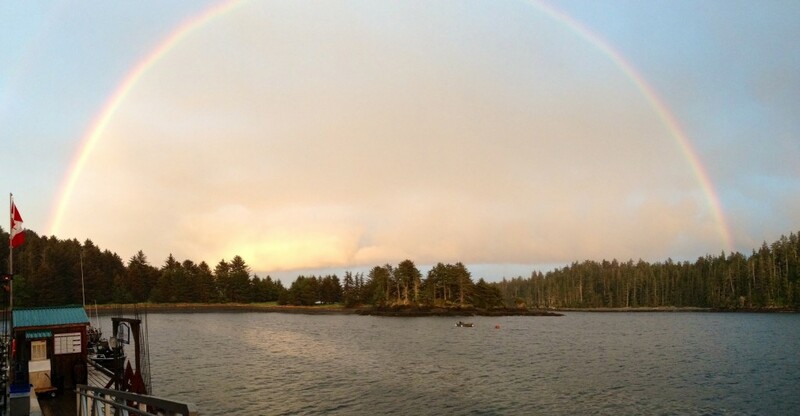 * The pot of gold known as Langara Island open for business. 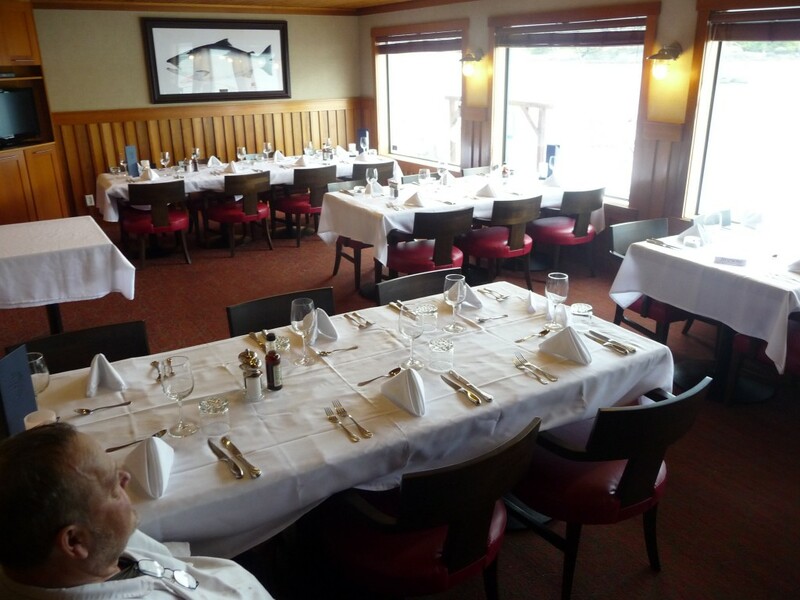 * Chef Walter looking over the new dining room decor and enjoying the view. * DJ enjoying being back out on the water and especially pleased with the off season addition of the T-top to his boat. * 55 pound release for Dennis Dieni and guide Drew Manson. 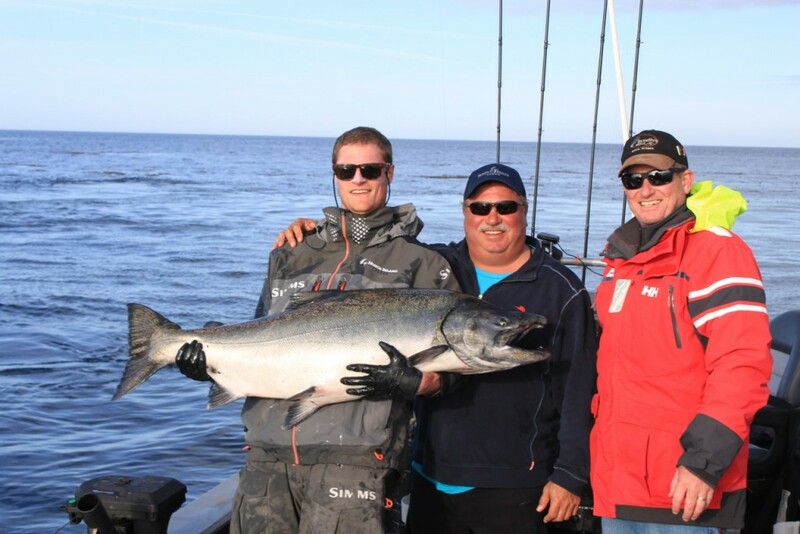 * 36lb tyee for Jamie Myers and guide Brent Gallagher. * Guest Peter Degroot and guide Jacob “Ginger Snap” Brunelle with this beauty 40 pound release. * 41 lb release for Richard Butland and guide Tanner. We would like to congratulate Bruce Vereshagen, a long time North Island Lodge guest that after years of working for larger fish over the last few seasons was rewarded with a 48 pounder at Lacy Island to seal the deal. Unfortunately we don’t have any pictures of this once in a lifetime fish, but Bruce sure did put in the time and was well rewarded. Congratulations Bruce! 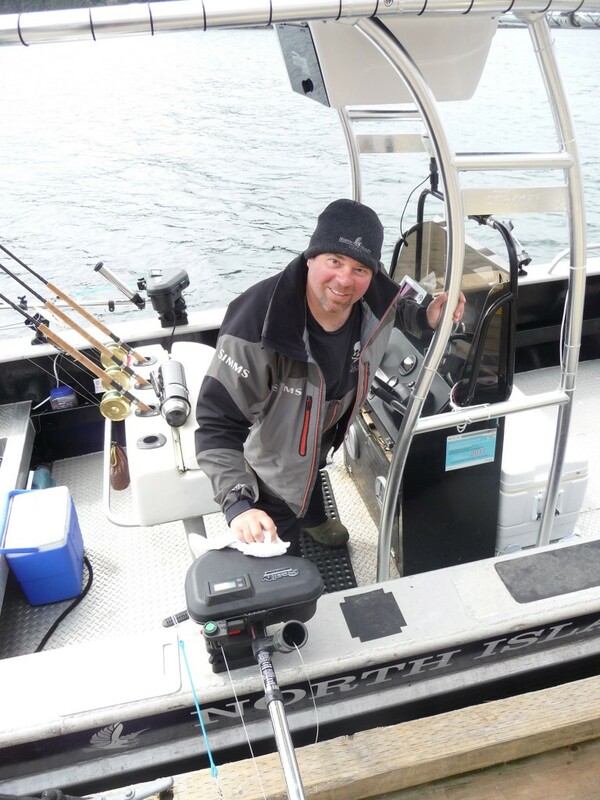 When our guests wanted to change things up from the Chinook program, the fishing for Cohos was great all month long and overall the weather was perfect to spend a couple hours out on the pick looking for Halibut. In one stellar week our guests caught 9 Halis between 39 and 59 pounds – perfect take home size and a great reward for a few hours out on the pick. Around the third week of July the Chinook numbers increased and we had a larger average size than we had seen since the start of the month. The average Coho size was also up in the 10 pound range and we couldn’t have asked for better weather conditions. 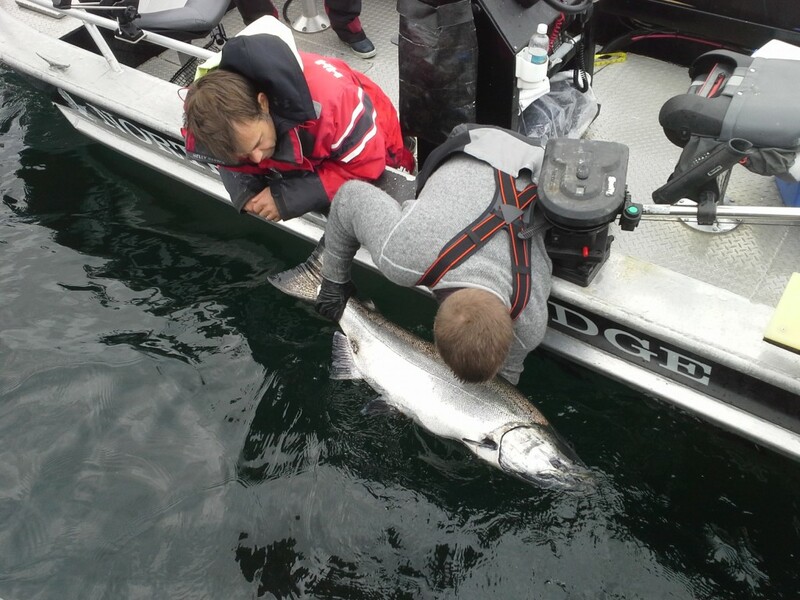 All was good on Langara Island! 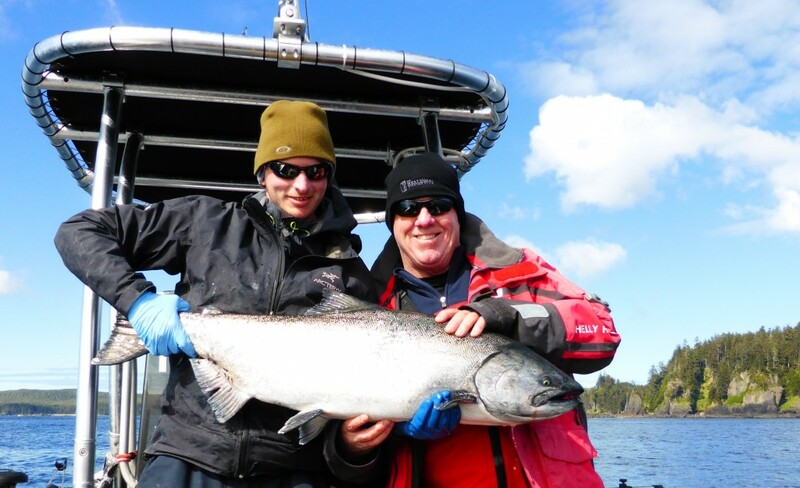 * 37lb tyee for Cecil Blair and guide Jacob Brunelle. * Ian and Sylvia Murray with a nice tote. * Robert Fale on the final morning got this buzzer beater 44 lb tyee – what a way to close out the trip on a beautiful calm morning. 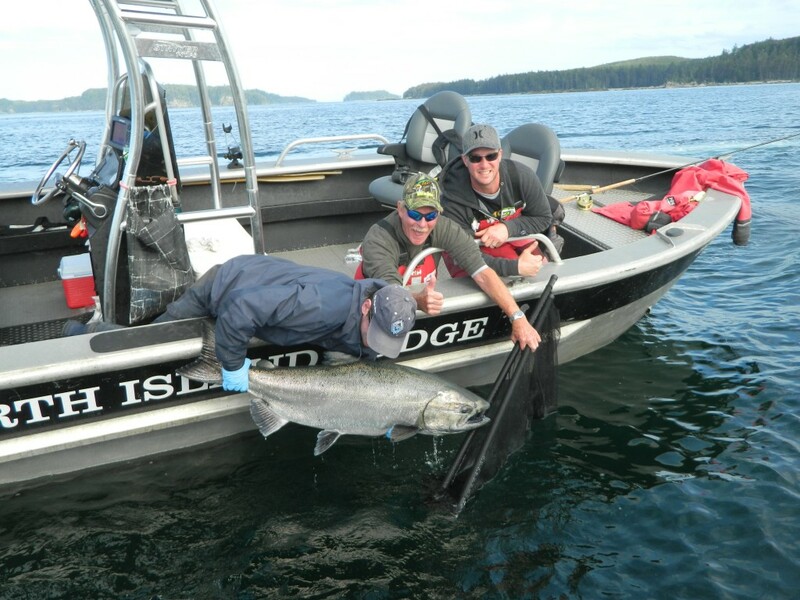 August was a spectacular month from start to finish that was full of great weather, calm water, Chinook Salmon averaging in the mid twenties, and all spots on the island producing tyees. Combine that with lots of big Cohos around and Sockeyes jumping everywhere and we had ourselves an action packed month. A lot of big fish stories to look back on from this month, but the most notable would be with guide Brent Gallagher, who was not to be outdone, and produced a 55 pound tyee for longtime guest and avid angler Mike Murphy who travels all over the coast and this was his largest tyee release to date. Congrats! On the 31st of August we said goodbye to our last group of guests and it’s never easy shutting down for the season when the fishing is still so strong. On behalf of all the staff from North Island Lodge I would like to thanks all of our guests who joined us this season and we look forward to welcoming you back soon. * 55lb release for Mike Murphy and guide Brent Gallagher. 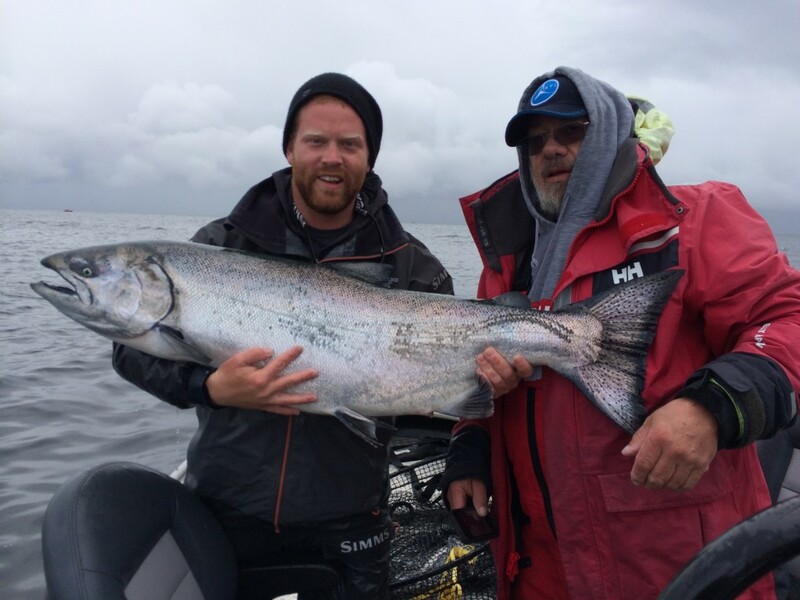 * 45lb tyee for Steve Kilgor and guide Jacob Brunelle. 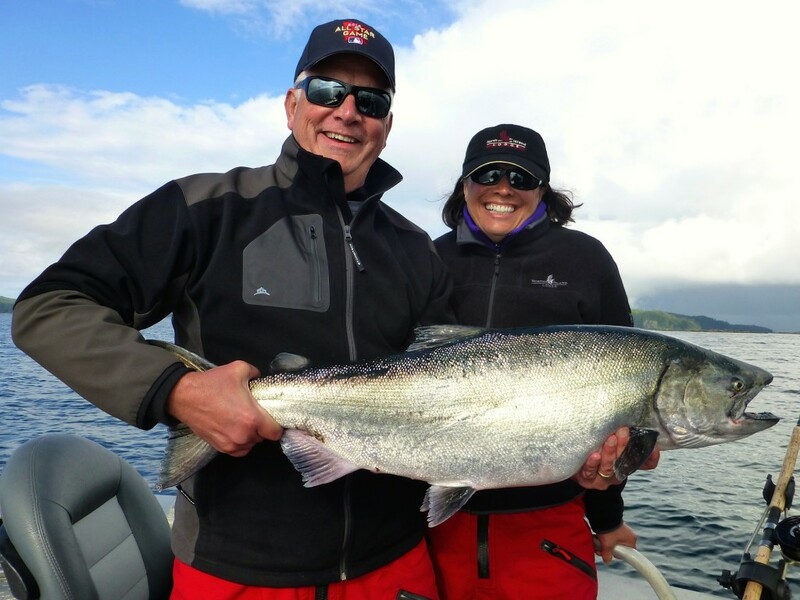 * 36lb tyee for Al and Amy Norris.